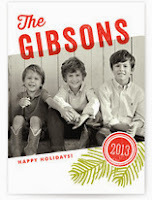 Have you ordered your holiday cards yet? If not you better get on it! 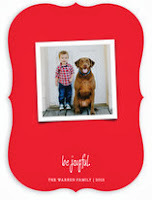 And when you see some of the designs at Minted.com you are going to feel inspired! I love Christmas cards with photos. I send them every year. And I always try to sign something personal - because to me, a generic card with no pics and just a "Love, Sally + Mike" is so impersonal. That's why I love these photo cards- they are such a nice way to share your pictures with your friends and family! I want to see where you went this year and hear about what's new in your life. 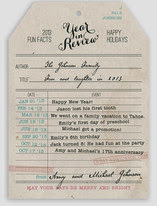 So even though it doesn't have pictures- one of my favorite cards from Minted.com is the "Vintage Library Card - Year in Review". You can tell your friends and family all about your year in one quick swoop! Check it out at right: I just think it's such a sweet way to celebrate the year. With Minted, you can shop unique designs from independent sellers. You won't have the same card as every other family on the block - you'll find something extraordinary. And there are tons of options to choose from! You can choose colors, styles, paper weights & shapes, the type of card you want (flat, folded) and even add a backer option, so you can write all those personalized messages we love! But Minted doesn't just have cards, they have stationary, journals, business cards, menus, calendars, room signs, photo art and more! If it's printed on paper, chances are they have what you are looking for! Make sure you check out Minted.com for your photo cards this year - and maybe even order some stationary for the rest of the year! Buy it: Get up to 20% off your order this weekend with coupon code BFHOL13 ! Have you ordered your cards yet? Let me know!